Teen Darwaja (Tran Darwaja, Three gates) - It is composed of 3 arched entrances was built by Sultan Ahmed Shah to serve as a royal entrance to Maidan Shahi. Mughal emperor Jehangir and his wife Nur Jahan used to watch the Tazia procession of Mahuram from over these gates. Ashtodia Darwaja - Dyes used to be brought into the city through Ashtodia Darwaja, a key trading . 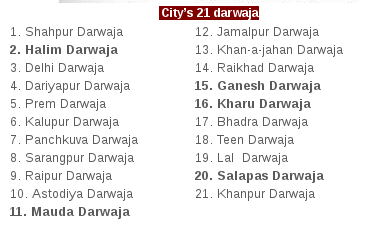 Raipur Darwaja - Commoners used Raipur Darwaja to enter and exit the city. Sarangpur Darwaja - People used to enter and exit the city through Sarangpur Darwaja. Panchkuva Darwaja - Panchkuva Darwaja was built when the city grew in size. Prem Darwaja - Prem Darwaja was used by traders to transport their goods. Kalupur Darwaja - Food supplies were brought into the city through Kalupur Darwaja. Dariyapur Darwaja - Soldiers and their convoys used to pass through Dariyapur Darwaja. Delhi Darwaja (Dilli Darwaja) - Delhi Darwaja, as the name suggests was a transit point to the capital Delhi. Shahpur Darwaja - People reached Sabarmati River by accessing Shahpur Darwaja. Khanpur Darwaja - Khanpur was an entrance to the King's garden. Jamalpur Darwaja - Jamalpur Darwaja was an exit point to Vadodara and other cities. Halim Darwaja - Halim Darwaja once stood in Shahpoor. Soldiers used to march into the city through this gate. Mauda Darwaja - Mahudha Darwaja was built in Panch Kuva area. It was a goods' passage. Khan-a-jahan Darwaja - Khan-a-jahan Darwaja was an emergency exit. Raikhad Darwaja - People used to go to the Sabarmati through Raikhad Darwaja. Ganesh Darwaja - Ganesh Darwaja once stood in area that's currently tucked under Ellis Bridge. It provided people access to the sabarmati river. Kharu Darwaja - Kharu Darwaja was built in Karanj to provide soldiers an additional post. Bhadra Darwaja - Rulers from other states entered the city through Bhadra Darwaja. Lal Darwaja - Lal Darwaja once stood in front of Siddi Sayyed Mosque. Salapas Darwaja - Salapas Darwaja stood in the area which is currently close to Advance Talkies. The Queen's convoy used it.